Specializing in handcrafted fine jewelry, one of a kind designs, limited editions and custom designs. Visit us! We are located at 507 Main St. Ames. Regular hours are Tuesday and Thursday 10-3, Thursday 5-7 pm, Friday 10-12, and Sat 10-1 and by appointment. We look forward to working with you! We opened in 2009, selling a unique collection of jewelry, but have been actively making jewelry since 2005. Over the past decade our selection has evolved to become a well-edited assortment of contemporary and custom jewelry for all occasions. 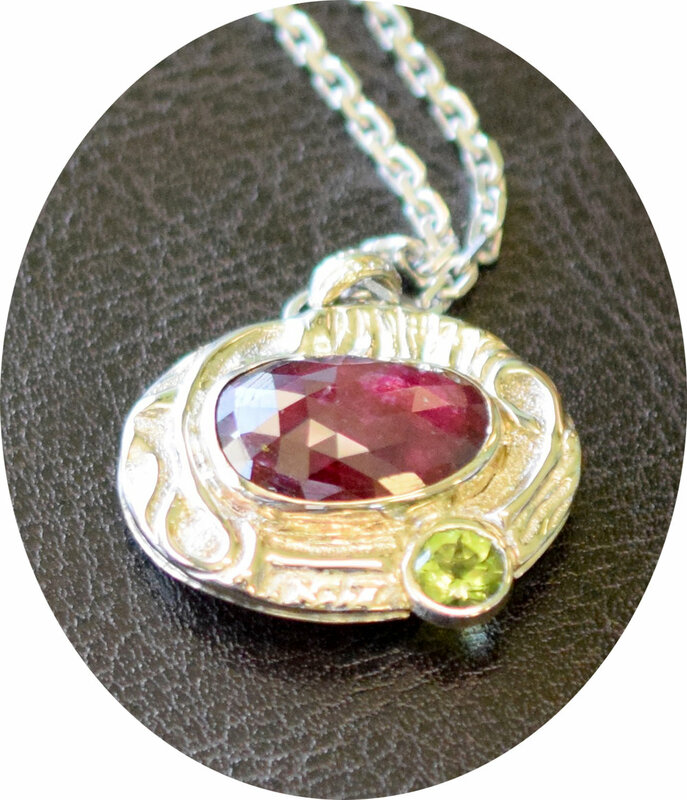 Lauren's Mother's Pendant features a beautiful rose cut ruby and peridot in a 14k palladium white gold custom design featuring an Art Nouveau inspired theme with the letter L.